We only recommend products and services we wholeheartedly endorse. This post may contain special links through which we earn a small commission if you make a purchase (there is no additional cost to you). Thank you for supporting Trayer Wilderness with your purchases! 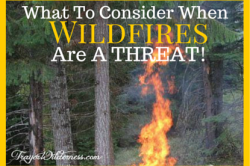 The Pacific Northwest is under attack with wildfires… Are you and … Continue reading What You Should Consider When Fire Is A Threat?